If you have "Right Leg of the Forbidden One", "Left Leg of the Forbidden One", "Right Arm of the Forbidden One" and "Left Arm of the Forbidden One" in addition to this card in your hand, you win the Duel. This monster appears in the artwork of Contract with Exodia. This card appears in the artworks of Exchange and Damaging Hand. In all International versions of this card, Spellbinding Circle appears in their artworks. In the Japanese versions, a pentagram star is depicted instead. Exodia's complete form has 5 counterparts: Exodia Necross, Exodius the Ultimate Forbidden Lord, The Legendary Exodia Incarnate, Exxod, Master of The Guard, and "
This is the only card that can allow a victory before either player has a turn. This is the only card whose effect text contained either of the words victory or automatic. The phrase has since been changed, along with all other victory condition cards, to You win the Duel instead of automatic victory. In Yu-Gi-Oh! The Duelists of the Roses, this card had to be on the field to in order to win. In the English Dub, this card is nicknamed the Exodia Head, since this card's artwork is mostly a close-up of Exodia's head. In the anime, this card's non-card form is only Exodia's head. Exodia's dismemberment appears to be a reference to the Egyptian god Osiris: who was sealed away and dismembered by the god Set. Osiris is the god of death and judgement. Due to the 5 cards only featuring the head and 4 limbs, the full body cannot be seen within those cards. The Bandai version of this card is Level 8, the Konami version is Level 3. This card, along with its limbs, have kept the same status on the Forbidden & Limited Lists longer than any other card in the game. They have all been Limited since the lists were started. This card was one of the first 5 Effect Monsters to be released. The other 4 were Armed Ninja, Man-Eater Bug, Hane-Hane and Reaper of the Cards. Out of all five this is the only one that doesn't have a Flip Effect. This is the first card set that can only be used to its full effect if a set of cards is gathered in a player's hand. The Master Collection Volume 1 release of this card had a typo that missed the r letter in your, which led the text to need all 5 pieces to be in you hand. In Yu-Gi-Oh! Duel Generation, when this card's victory condition is achieved, the winning player will declare either Exodia Finale or Face the Unstoppable! Exodia may be a blend of exo- (“outside”) +‎ dia in Latin means deity". If you play "Graceful Charity" and (after discarding) you have the 5 pieces of "Exodia", you win the duel before "Magical Thorn" inflicts damage. : What happens when simultaneously your Life Points become 0 and you declare victory with Exodia? After resolving a Chain Link, if you have "Exodia the Forbidden One"/"Right Arm of the Forbidden One"/"Left Arm of the Forbidden One"/"Right Leg of the Forbidden One"/"Left Leg of the Forbidden One" in your hand, you immediately win the Duel. If your opponent activates "Delinquent Duo" and you chain "Backup Soldier", "Backup Soldier" will resolve first. If you have all five pieces in your hand, you will win the Duel before "Delinquent Duo" resolves. : If "Delinquent Duo" is activated and "Backup Soldier" is chained and you complete Exodia, then is a victory declared? When you have 300 Life Points and activates "Graceful Charity" while "Skull Invitation" is active, if you have "Exodia the Forbidden One"/"Right Arm of the Forbidden One"/"Left Arm of the Forbidden One"/"Right Leg of the Forbidden One"/"Left Leg of the Forbidden One" in your hand after "Graceful Charity" resolves, then you immediately win the Duel before resolving the effect of "Skull Invitation". : If "Skull Invitation" is active and "Graceful Charity" activates and completes "Exodia", who is the winner? If each player has a "Sangan" sent to the Graveyard simultaneously by "Dark Hole" etc, the two form a Chain and you resolve backwards. The Turn Player's "Sangan" is Chain Link 1, and the opponent's is Chain Link 2. If each player has four pieces of "Exodia" in his hand, then Chain Link 2 resolves first and the opponent is declared the winner before Chain Link 1 resolves. : If both players' "Sangan"s activate simultaneously and both complete "Exodia the Forbidden One", who is the winner? If both players draw all five pieces of "Exodia the Forbidden One" from the effect of "Morphing Jar", then the Duel ends in a DRAW. : Who wins the Duel if both players complete "Exodia the Forbidden One" simultaneously? If a player completes "Exodia the Forbidden One" while "Prohibition" is active and declaring "Exodia the Forbidden One", then that player still wins the Duel. : Do you still win the Duel if you complete "Exodia the Forbidden One" while "Prohibition" has "Exodia the Forbidden One" declared? For cards like "Graceful Charity", "Dark World Dealings", "Solar Recharge", "Allure of Darkness", "Common Charity", and similar cards: if you draw the fifth piece of "Exodia the Forbidden One" through this effect, then you declare victory after you finish fully resolving the effect. If the second part of the effect causes you to discard a piece, then after you finish fully resolving the effect "Exodia the Forbidden One" is no longer complete, so you cannot declare victory. : If you draw the fifth piece of "Exodia the Forbidden One" with "Graceful Charity", then do you win without resolving the effect which has you discard? Suppose that both players have "Appropriate" active, and that they are in the middle of a "loop" where both players keep drawing. If a player completes "Exodia the Forbidden One" during that loop, then he immediately wins the Duel and there is no more drawing. : Who wins the Duel if both players have "Appropriate" active and both complete "Exodia the Forbidden One"? When resolving the effect of "Pot of Greed" or "Appropriate", if the only card left in your Deck is the last piece of "Exodia the Forbidden One", then you lose the Duel because you cannot draw when you are forced to draw. : Who wins the Duel when "Pot of Greed" forces you to draw the last card in your Deck, which has you complete "Exodia the Forbidden One"? When you draw the fifth piece of "Exodia the Forbidden One", you win the Duel as soon as all five pieces are in your hand. Your opponent cannot activate "Drop Off" in response, since the Duel has already been won. : Can you activate "Drop Off" when the opponent draws "Exodia the Forbidden One"? If you draw the fifth piece of "Exodia the Forbidden One" while "Deck Devastation Virus" is active, then you immediately declare victory before the effect of "Deck Devastation Virus" destroys the last piece. : What happens if "Exodia the Forbidden One" is completed while "Deck Devastation Virus" is active? When a player adds the fifth piece of "Exodia the Forbidden One" to his hand, he must declare victory immediately. He cannot refuse to declare victory. : Can you not declare victory when you have "Exodia the Forbidden One" (etc) in your hand? At the start of the Duel, if the player going second starts off with all five pieces of "Exodia the Forbidden One" in his hand, then he wins the Duel before the first player draws his card. The same applies if the player going first starts off with all five pieces. If both players have all five pieces of "Exodia the Forbidden One" in their hands at the start of the Duel, then the Duel ends in a DRAW. : If the player going second has all five pieces of "Exodia the Forbidden One" in his hand, then when does the player going first lose? When you add the fifth piece to your hand and declare that you win the Duel, you are using a victory condition. You are not activating a monster's effect, so "Divine Wrath" and "Gladiator Beast War Chariot" cannot be activated. : Can "Divine Wrath" (etc) be activated when "Exodia the Forbidden One" (etc) are in the hand? Exodius the Ultimate Forbidden Lord: A single "Exodius the Ultimate Forbidden Lord" must send all five "Forbidden One" cards to the Graveyard for you to win the Duel. 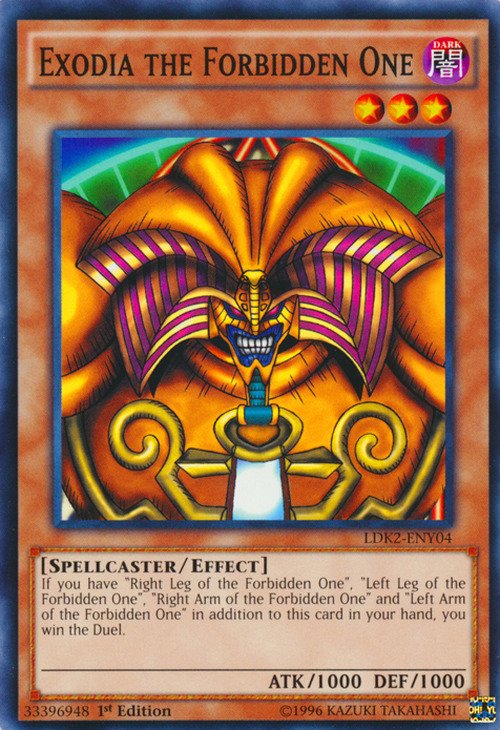 If multiple copies of "Exodius the Ultimate Forbidden Lord" send a total of five "Forbidden One" cards to the Graveyard, you do not win the Duel. : When multiple "Exodius the Ultimate Forbidden Lord" send 5 "Forbidden One" cards to the Graveyard, is the Duel won? If "Foolish Burial" sends one piece to the Graveyard, you do not win the Duel. : When "Exodia the Forbidden One" etc are sent to the Graveyard by both "Foolish Burial" and "Exodius the Ultimate Forbidden Lord", is the Duel won? If both players have all 5 of the cards listed on "Exodia the Forbidden One" in their hand at the same time, such as if both players start with all 5 of the cards in their opening hand, or if both players draw all 5 cards by the effect of "Card Destruction", the game is declared a DRAW. Appropriate:" If you and your opponent have "Appropriate" face-up and you or your opponent draw a card outside of your respective Draw Phases, the effect of each "Appropriate" is applied until you or your opponent cannot Draw a card and lose the Duel or gather all 5 pieces of "Exodia" into your respective hand and win the Duel. This process does not start a Chain. Backup Soldier: If your opponent activates "Delinquent Duo" and you chain "Backup Soldier" with 2 pieces of Exodia and retrieve the other 3 from your Graveyard you win the Duel before you have to discard for "Delinquent Duo". This is because you check for victory conditions in between steps in a chain, (but not in between two separate effects of a single card like "Graceful Charity"). Deck Devastation Virus: If you have the four limbs of Exodia in your hand when your opponent activates "Deck Devastation Virus" they will be destroyed. You can use two "Backup Soldier" to return them to your hand and they will not be destroyed (they were not drawn). If on your next turn you then draw "Exodia the Forbidden One" you will win the game before "Exodia the Forbidden One" is destroyed by the effect of "Deck Devastation Virus". Graceful Charity: If you have three pieces of Exodia in your hand, "Graceful Charity", and no other cards, and then you activate "Graceful Charity" and draw the final 2 pieces of Exodia, you must discard 2 cards before a victory can be declared, but after you discard you will no longer have all 5 pieces of Exodia, and cannot declare a victory. Prohibition: If "Exodia the Forbidden One" is declared with "Prohibition", when a player has all five pieces of Exodia in their hand, they win the Duel. This is a win condition and cannot be prevented with "Prohibition". Skull Invitation: If you draw the final piece of "Exodia" with "Graceful Charity" and have all 5 pieces of "Exodia" in your hand after discarding, you win the Duel even if the damage resulting from "Skull Invitation" would reduce your Life Points to 0.